In the realm of the spaghetti western, there are the Sergio Leone films and then there’s everything else. The head of the class of “everything else” is generally agreed to be Sergio Corbucci’s Django. Back in 1978, before he was a film director himself, Alex Cox wrote a 249-page book on the subgenre he loved, called 10,000 Ways to Die. (Cox would return to the manuscript, spruce it up, and publish it in 2008.) 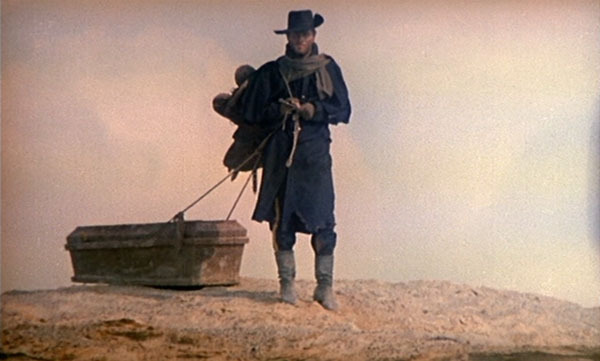 About Django he said, “Corbucci’s masterpiece — a cruel morality fable of monsters at war with each other and with the world….Django is the Italian Western par excellence.” Yep. Once you get past the mildly goofy theme song (“Django, have you never loved again?”), this is a dark, bitter, politically aware shot of whiskey in which greed and hatred crush love under their muddy bootheels. Played with iconic calm by Nero, Django doesn’t really trust anyone. The Mexicans are scum. The racists are worse scum. The world turns everyone into scum or whores. The best thing a man like Django can do is tentatively ally himself with the lesser of two bands of scum — if he has to, or if it would benefit him. Django is an inhumanly fast shot, and once he breaks out what’s in his coffin, he turns into a true rapid-fire Grim Reaper. The Mexicans want a revolution, and are trying to scare up enough cash to get weapons to wage some serious war. At least they have a better justification for killing than simple mad-dog hatred of dusky skin. Early on, we see Major Jackson forcing one Mexican after another to run, and then picking them off with his rifle, for sport. After one victim falls, his grief-stricken children run to him. It was perhaps only the censorious strictures of the time that discouraged Corbucci from showing Major Jackson blowing the children away, too. “Nits make lice,” said Col. John Milton Chivington, who led the notorious 1864 Sand Creek Massacre on a village of Cheyenne Indians and defended his troops’ slaughter of babies. Chivington’s long shadow darkens Django. The movie can be seen as a sidewise Yojimbo riff, Leone’s A Fistful of Dollars being the first (and less politically fraught). Django, though, isn’t just out for money, and he doesn’t play the two warring factions against each other. His motive is revenge for his lost beloved. This makes the movie a little more simplistic than it has to be. If the Mexicans, not Major Jackson, were responsible for Django’s loss, would he then stand with the racist pigs? Or would he strategize more like Mifune and Eastwood? We don’t know. We don’t know much about Django other than that he still nurses his loss, he’s a thief and killer, and he has some positive history with the Mexicans’ leader, Gen. Hugo Rodriguez (José Bódalo). But as the story plays out, we see that Django is trying to escape his past and buy himself a new life. He puts too much stock in gold as his ticket out. He can’t have a new life while employing the skills of his old life. Much has been made of the film’s violence, though by today’s standards it may strike some as tame. Back in 1966, the body count weighed in as pretty high, and the ear-cutting scene is still fairly gruesome. This was Corbucci’s way of saying that there was no honor possible in the Old West, just self-preservation and ignobly butchered corpses. “It is intensely cruel, anti-clerical, polyglot, and infested with religious symbolism,” wrote Alex Cox. There was no God but the white God, and He apparently said it was A-OK to murder people who looked different. The monuments to this absent God are everywhere in the film, in this world where love is a mockery. God is death. Even the climate is grotesque: mud and infertile dust, and bitter cold — even indoors, we can see the steam of people’s breath. It’s a simple story, but it sticks with you (even the mournful theme song, despite its overexplicit lyrics, will become an earworm for the next few days) because of what it says about humanity shackled by the structures it built: government, religion, commerce. We’re all whores, and we’ll all end up in a graveyard, our hands mangled, our pain unrelieved by revenge.